Species In Genus: 1 sp. Etymology: (Greek: straight spiral, from 1-sided raceme) Note: Once placed in Pyrola. Habit: Perennial herb, +- shrubby or not, < 20 cm, evergreen, rhizomed. Leaf: +- cauline, generally near base, 1.5--6 cm, ovate-elliptic, leathery or not, entire to finely crenate, petioled. Inflorescence: raceme, elongate, 1-sided, arched, +- erect in fruit; peduncle densely papillate; bracts several, generally lanceolate. Flower: radial, +- closed, parts in 5s, free; petals with 2 basal tubercles adaxially, +- green to cream-white; stamens 10, filaments +- narrow throughout, glabrous, anther pores not on tubes; nectary present; ovary superior, style straight, exserted, stigma peltate, lobes 5, shallow, domed. Fruit: capsule, pendent; valves opening base to tip, margins fibrous. Chromosomes: 2n=38. 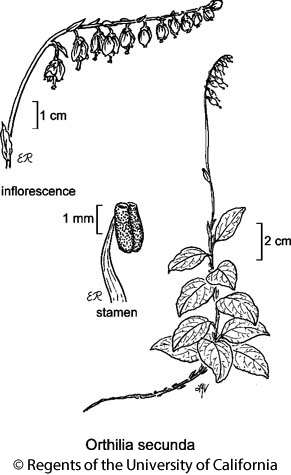 Citation for this treatment: Gary D. Wallace & Erich Haber 2012, Orthilia secunda, in Jepson Flora Project (eds.) Jepson eFlora, http://ucjeps.berkeley.edu/eflora/eflora_display.php?tid=35496, accessed on April 22, 2019. KR, NCoRH, NCoRO, s CaRH, SNH, SnBr, SnJt, MP, SNE (exc W&I); Markers link to CCH specimen records. Yellow markers indicate records that may provide evidence for eFlora range revision or may have georeferencing or identification issues. Purple markers indicate specimens collected from a garden, greenhouse, or other non-wild location.